You ain't no Frank Gore. So the Seahawks travel to the second biggest joke in the NFC West. Boy, what a team in shambles. The San Francisco 49ers have SO. MUCH. TALENT. Hats off to Alex Smith and Mike Singletary for making such a talented team so unbelievably terrible. In any case, the Seahawks are getting Colin Cole back from injury. It’s getting a lot of hype in the news, but honestly I don’t think it’s going to make that much of a difference in the run game. I’m going to stick to that. Is he really that big of an improvement over Junior Siavii? No, not really. The magic happened with Red Bryant. Without him, the synergy is lost. Sliding Siavii to the edge isn’t going to do it, either. He doesn’t compare to Bryant in regards to pure athletic ability. It was Bryant’s ability to blow back tackles and set an edge. Siavii won’t achieve that. There’s a reason other teams don’t field replacement level 315lb defensive tackles at end. It may not matter, however, because the 49ers’ offensive line is battered, young and generally struggling. San Francisco’s offensive line is 28th in the league in adjusted sack rate, at 8.5%. That’s bad, and if you look at their schedule, it’s worse. Unless they’re playing the Cardinals, they can’t run the ball all that well, either. Brian Westbrook is no Frank Gore. And well, they’ve got Alex Smith under center. So I don’t have to tell you about the passing game. On top of that, shutting down Vernon Davis could happen: the Seahawks are 4th in the league defending vs. the tight end. 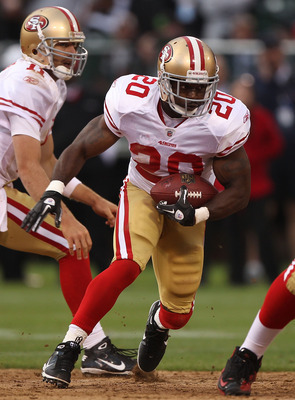 San Francisco’s offense could be anemic. Now where are the 49ers strong? San Francisco’s strength lies in their defense. It’s 14th overall in DVOA, and 6th against the run. The Seahawks don’t play well on the road, and the run offense is still shaky at best. It’s outing last week was fairly successful, but context is everything. What team doesn’t run successfully against the Carolina Panthers? Their run defense allows an average of 133 yards per game. The run game will be tested on Sunday, and it’ll likely struggle. On top of that, I’m not holding my breath for Mike Williams or Ben Obomanu. So the passing game could again be without two of its best targets. The Seahawks offense could be quite anemic. Yeah, yeah. It’s kind of a downer post. So time for some good news: on top of San Francisco’s lengthy list of injuries, it appears that NT Aubrayo Franklin may not play, either. That’d be a HUGE blow to their run defense. Franklin’s a monster, and is the linchpin of the defense. The Seahawks’ interior offensive line has been struggling, primarily at both guard positions. No Franklin could give a much needed breath of fresh air to Marshawn Lynch and the Seahawks offensive line. Even if he does play, he’s dealing with a groin sprain, and I doubt he’ll play at 100%. The Seahawks could deliver the most satisfying knockout blow EVER this weekend by beating the 49ers in San Francisco. Knocking the 49ers out of the playoff race in week 14. God it feels good to type that. How epic is that? This is a team that just about everyone thought was a lock to win the NFC West. Give em hell, Seahawks, and show ’em who’s boss in the NFC West. This entry was posted in Seahawks Analysis, Seahawks Rumors and tagged Ben Obomanu, Colin Cole, Junior Siavii, Marshawn Lynch, Mike Williams, Red Bryant, Seattle Seahawks. Bookmark the permalink.